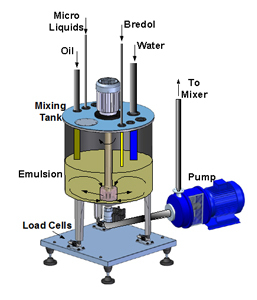 The application of liquids into feed mixers can often be a cumbersome and complicated process. Cleans up mill operations by removing pumps, lines and spray nozzles that often “clutter” the facility. Provides the potential to save costs by applying novel or new liquids such as vitamins, pigments, enzymes, oils, choline etc. Provides a single liquid emulsion that will allow all products to easily, evenly and quickly penetrate the feed matrix.